I am having the opportunity to compare images using the Pentax standard definition endoscope VNL-1170K and the high-definition VNL-1590STi. This patient has amyloid depositions in the vocal cords. 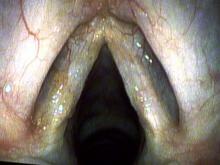 They cause a stiffening of the vocal cord and allow air to leak out.